1. 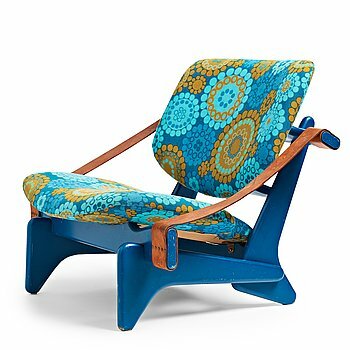 Olof Ottelin, an easy chair, "Jumbo", nr 174, Kervo for Stockmann OY, Finland, 1960-70's. 2. 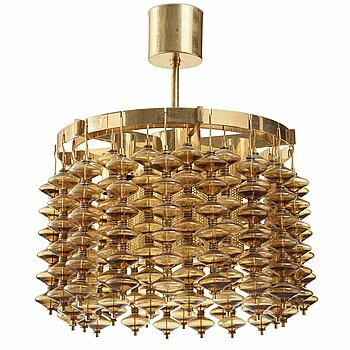 Hans-Agne Jakobsson, an "Estrella" ceiling lamp, model T580/H, Markaryd, Sweden 1960-70's. 3. 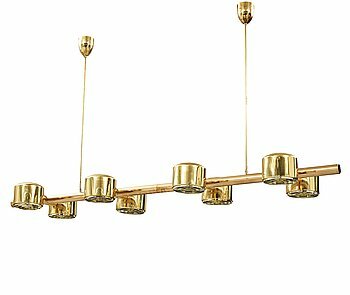 Hans-Agne Jakobsson, a large ceiling lamp, Markaryd, Sweden 1960-70's. 4. 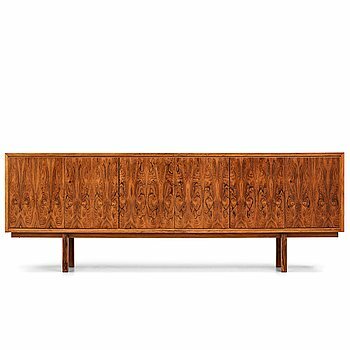 SCANDINAVIAN DESIGNER, a rosewood sideboard, probably Denmark 1960's. 5. 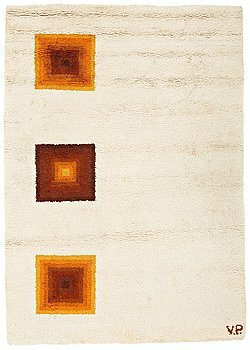 Verner Panton, A CARPET, handknotted, Morocco, ca 295 x 209 cm, signed V.P. (Verner Panton). 6. Jonas Bohlin, a unique armchair, Källemo, Sweden 1985. 7. Jonas Bohlin, a "Slottsbacken" cabinet, Källemo, Sweden post 1987. 8. Mats Theselius, an "Aluminium" easy chair, Källemo, Sweden post 1990. 9. Mats Theselius, an easy chair, "Älgskinnsfåtöljen", Källemo, Sweden post 1991. 10. Mats Theselius, an easy chair, "Älgskinnsfåtöljen", Källemo, Sweden post 1991. 11. Mats Theselius, a Ferrari red "Canapé", Källemo Sweden, post 1991. 12. Mats Theselius, a pair of "el Rey" easy chairs by Källemo, Sweden, post 1999. 13. John Kandell, a "Gestalten" mahogany cabinet, Källemo, Sweden post 1989. 14. Mats Theselius, a pair of "Aluminium" easy chairs, Källemo, Sweden post 1990. 15. Alf Linder, a sofa table, Källemo, Sweden post 1995. 16. Mats Theselius, an "el Rey" easy chair by Källemo Sweden, post 1999. 17. Mats Theselius, a daybed, "Chaise Longue", Källemo, Sweden post 1992. 18. Mats Theselius, an easy chair, "Järn/Moccafåtöljen", Källemo, Sweden post 1994. 19. Mats Theselius, a "Blackbird" table by Move, Sweden, post 2001. 20. Mats Theselius, an "El Dorado", easy chair, Källemo, Sweden post 2002. 21. Mats Theselius, an "El Dorado" easy chair, Källemo, Sweden post 2002. 22. Marika Dymling, a sterling vase, Atelier Akiram, Stockholm 1978. 23. 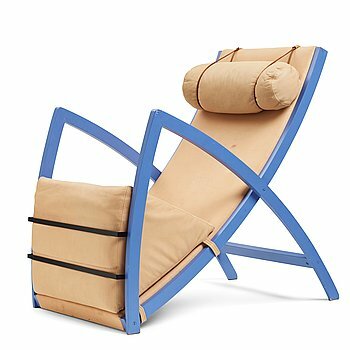 Sigurdur Gustafsson, a "Rock´n Roll" rocking chair for Källemo Sweden, post 1999. 24. Firma Svenskt Tenn, a coffee table, designed in 2009. 25. Eva Hild, a unique stoneware sculpture, "Bumling" series, Sweden 2000. 26. Eva Hild, a unique red glazed stoneware sculpture, "Bulig", Sparsör, Sweden 2002. 27. Matti Klenell, A unique Matti Klenell free blown glass "Urn" sculpture, executed at the Michael Davis studios, Queens, New York 2004. 28. Matti Klenell, a unique free blown and solid glass "Ajeto Urn", produced at the Ajeto Glassworks, Czechia 2008. 29. 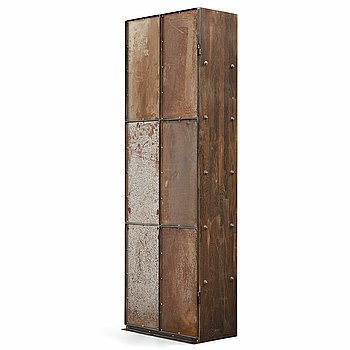 Kerstin Olby, a unique "Rhapsody" cabinet by Olby Design 2010. 30. Charles & Ray Eames, a lounge chair with ottoman, Herman Miller, USA 1980's. 31. Robert Indiana, A CARPET, "White on Black", Chosen Love, hand tufted in 1995, ca 243,5 x 244,5 cm, Robert Indiana. 32. Arne Vodder, a palisander sideboard, Sibast Furniture, Denmark, 1960´s. 33. A pair of Scandinavian easy chairs, 1950-60´s. 34. Eero Saarinen, a 'Tulip' oval marble top dining table, Knoll International. 35. SUPERSTUDIO, a ceiling lamp, "Olook" for Design Centre Poltronova, Italy 1960-70´s. 36. SUPERSTUDIO, a "Gherpe" table lamp for Design Center Poltronova, Francesconi, Italy 1960-70´s. 37. Ettore Sottsass, a ceramic vase and footed bowl by Bitossi - Montelupo, Italy. 38. SUPERSTUDIO, a "Polaris" lamp by Design Center Poltronova, Italy 1960-70´s. 39. GIANNI VILLA, a "Kalamo" lamp for Valenti, Italy 1970's. 40. 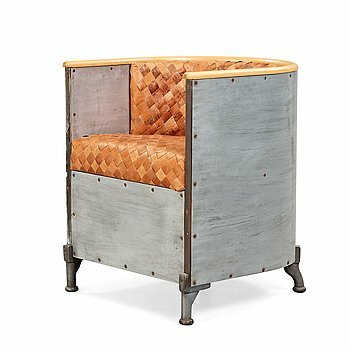 Peter Shire, An early "Bel air" easy chair, Memphis Milan, post 1982. 41. Michael Graves, a five pieces sterling tea- and coffee service, limited edition by Alessi, Italy 1985. 42. Michele De Lucchi, a "Kristall" table for Memphis, Italy. 43. Nick Ross, A unique "Little White Lies" coffee table, Studio Nick Ross, Stockholm 2018. 44. Fredrik Paulsen, a "Glass and steel chair", edition EA I/I, Studio Fredrik Paulsen 2017. 45. FOLKFORM, a "Suburban skyline" floor lamp, unique edition, Studio Folkform 2017. 46. Paolo Piva, a black lacquered steel and glass sofa table, B&B, Italy. 47. LEE WEST, an "Egg Chair" and ottoman, Lee West inc. USA 1970´s. 48. FRANCESCO BINFARÉ, an "On The Rocks" sofa, Edra, Italy, post 2004. 49. Fabio Novembre, A Fabio Novembre "Org" table for Cappellini, 21st century. 50. Ron Arad, RON ARAD, a version of the Rover-Chair, One Off, London 1980's. 51. Mark Brazier Jones, an "Angel" chair, England 2005. 52. Simon Klenell, a unique "Mirror" sculpture, blown by Klenell, Gustavsberg, Sweden 2018. 53. 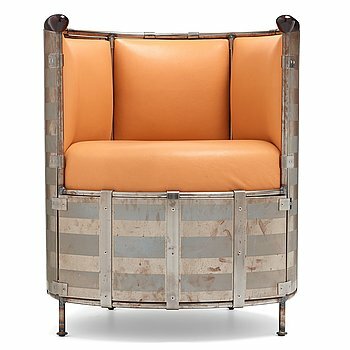 Tom Dixon, A Tom Dixon "Wingback chair" produced in Great Britain before 2015. 57. Lena Cronqvist, "Flicka i balja". 58. Marie-Louise Ekman, "Sömnen II". 61. Lars Englund, "Pars pro toto". 63. Lisa Jonasson, "Förbereda framtiden". 64. Emma Hartman, "Little red rock". 65. Magnus "NUG" Gustafsson, Untitled. 67. Emanuel Röhss, "Coral Diego". 74. Meta Isæus-Berlin, META ISÆUS-BERLIN, signed Meta Isaeus-Berlin and dated 2006. 77. Linn Fernström, "Flicka gör korstecknet". 78. Karl Norin, "Freshwater, steak, and wine". 80. Nathalie Djurberg & Hans Berg, "Turn into me". 81. Ylva Ogland, "Venus at Her Mirror". 82. Andreas Eriksson, "Solen går ner den 12 okt 2004 1809" (The sun sets Oct 12th 2004 1809). 83. Anders Widoff, "Bells calling for Aceh (1)". 85. Parker Ito, "The Agony and the Ecstasy (2)". 86. Ylva Ogland, "Xenia with Poppy Flowers, Fresh Cut poppy Capsule with Opium Sap, Syringe and Wisdom Tooth". 87. Niki de Saint Phalle, “Dancing Couple”. 88. Anders Widoff, "Grammatik: 1 och 2". 89. Martin Wickström, "Djävulen i kroppen". 90. Jan Håfström, "Mr Walker". 91. Ola Billgren, "Capri II". 94. Per Olof Ultvedt, "Sprutan" (SHE - a cathedral). 95. Ulrik Samuelson, ULRIK SAMUELSON, Signed US and dated ca 1970 on verso. 96. Alfred Boman, "Herbal Big Mac". 98. Ylva Ogland, "In any weather, at any hour of the day or night, I have been anxious to improve the nick of time, and notch it on ...". 99. Ylva Ogland, "Looking at the Unconscious (Rose Quartz)". 100. Lena Cronqvist, "Grimaser, mun". 101. Tomás Saraceno, "Untitled (study for 14 billions working title)".